Khychins are a vital element in Karachay-Cherkessia cuisine. If riding through breathtaking valleys in the morning, skiing in the afternoon, and overindulging on mouthwatering Caucasian cuisine in the evening sounds good to you, it’s time to book a flight to Karachay-Cherkessia (the diet-busting ‘khychins’ are worth the trip alone). Russia’s small but mountainous Karachay-Cherkessia Republic is famous for its hospitality. You’ll be greeted like an old friend by the locals, who will offer you mountains of food and rivers of drink, so perhaps bring a pair of elastic-waisted pants. The Caucasus Mountains beckon visitors with their age-old glaciers, deep valleys, and panoramic views. Russia Beyond explored Karachay-Cherkessia on foot, on horseback, and on snowboard - and one thing’s for sure: we’ll definitely be booking a return trip soon. Riding horses near the village of Krasny Kurgan. 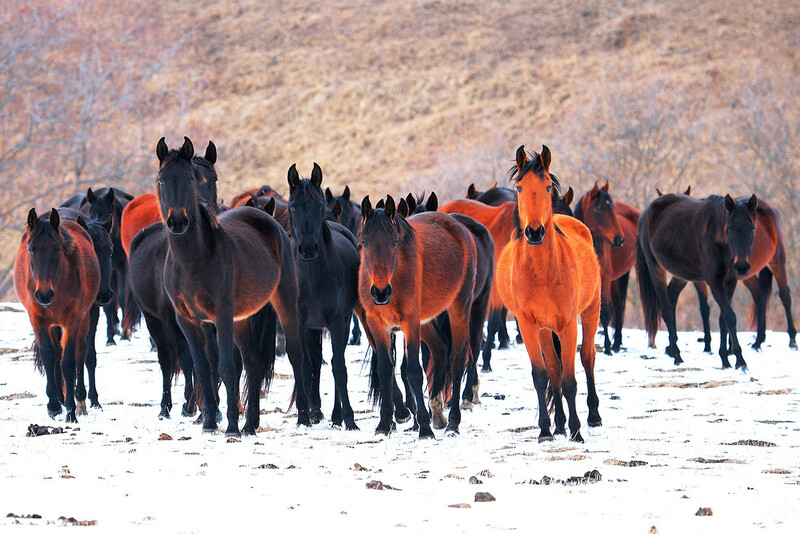 Karachay horses near Krasny Kurgan. Following this advice was easier said than done as my black Karachay horse’s sat nav was malfunctioning - it kept turning the wrong way into narrow paths! After a slightly uneasy start my steed turned out to be a fine filly and proved why the breed is regarded so highly for mountain hikes. A couple of hours into the ride I was really feeling at one with my horse. The all-season resort of Arkhyz. 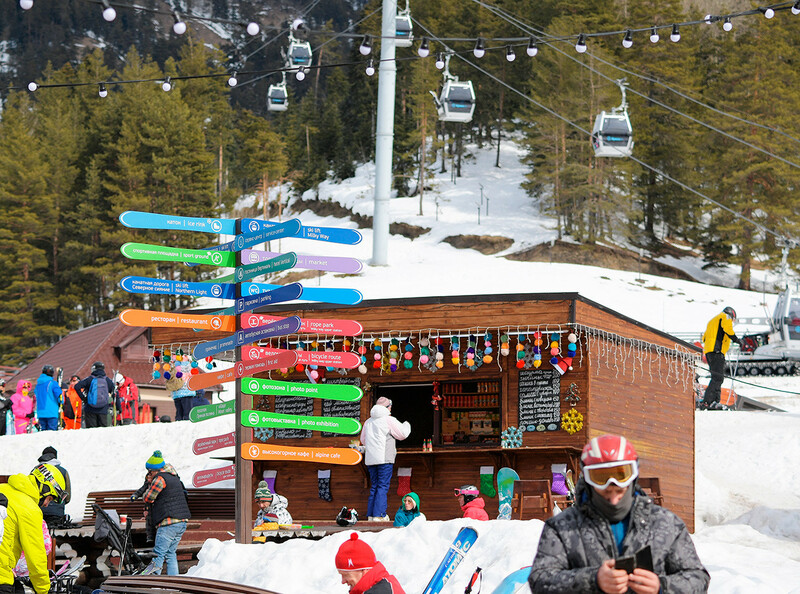 While tourists often choose to discover the region on horseback, the locals spend their free time carving up the slopes on snowboards and skis. The new all-season Arkhyz resort, which opened in late 2013, is the perfect place to run wild. I got my hands on a ski pass, rented a snowboard and helmet, and hit the slopes – well, the beginner slopes to start off with. The instructors offered the group some hot tips and after our backsides hit the cold deck about 30 times each we were let loose on the steeper runs, but not too steep. The skiing here is good but all those Instagram obsessed people out there be warned - you’ll have to wait until you’re at the bottom of the mountain (or at least halfway down) before posting your ski-selfie as there’s no signal or wifi at the top. 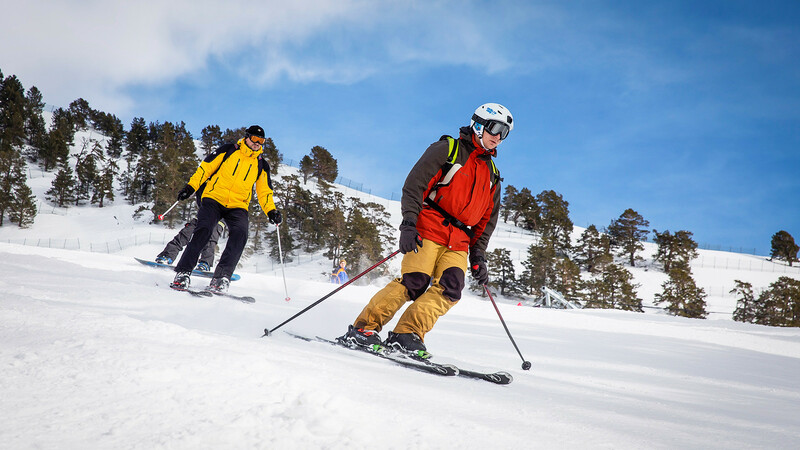 There were a number of experienced skiers enjoying their first trip to the resort, including Alexander from Ryazan, who normally spends his winter holidays in Sochi. He was loving the less crowded slopes and cheaper ski rental costs. Leonard and Margot from Voronezh have been to Elbrus and Dombay, but they said Karachay-Cherkessia is better thanks to the excellent customer service and condition of the slopes. Muscovites Vasily and Irina even compared the resorts to those in Europe, but warned that hotel prices can equal those in Austria during peak season. 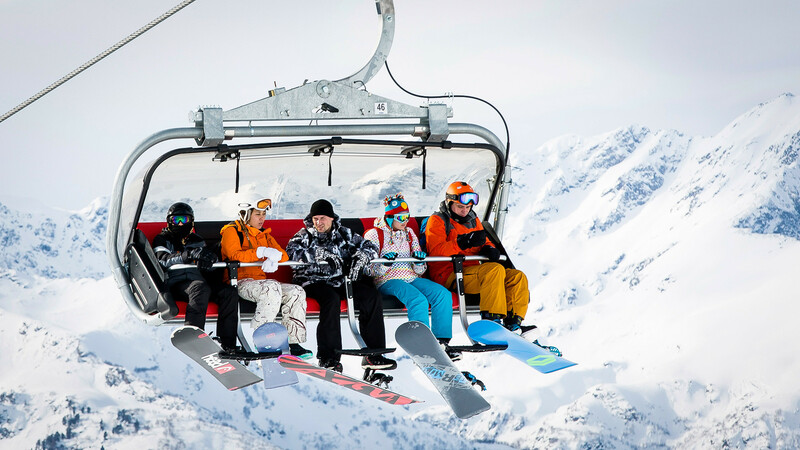 The settlements closest to the chairlifts have very poetic names like “Moon Meadow” and “Romantic,” but most of the young people prefer to book hotels a little lower down the slopes, in Arkhyz itself. There one can rent a reasonably priced room in a guest house closer to the apres-ski, which plays out in traditional Caucasian kebab joints. Arkhyz is also a more convenient starting point for the many excursions and day trips on offer. 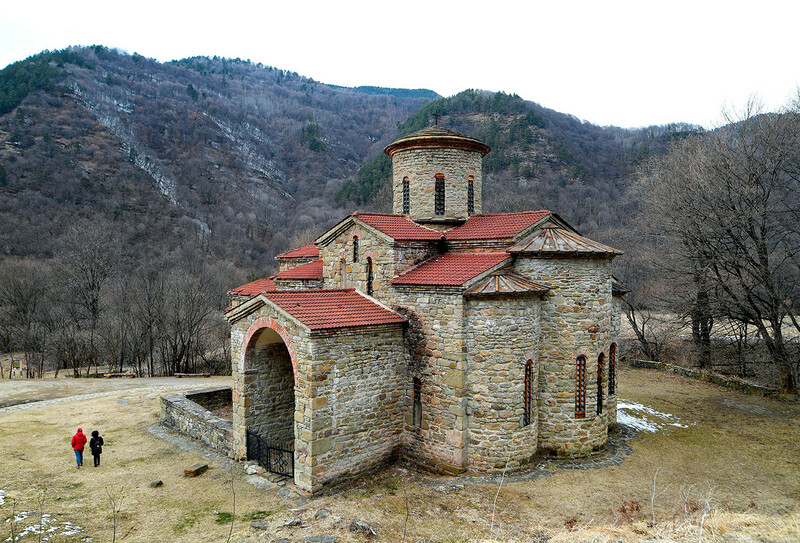 Ancient Alanian temple, c.X century. Up in the mountains it grows dark very quickly as the sun sets behind the steep slopes, but the stars soon shine bright against the jet black sky. There’s an ancient observatory in Nizhny Arkhyz, from which the Alans (who existed before the Middle Ages – apparently King Arthur has Alanian roots) studied the stars and established solstice dates 1000 years ago. 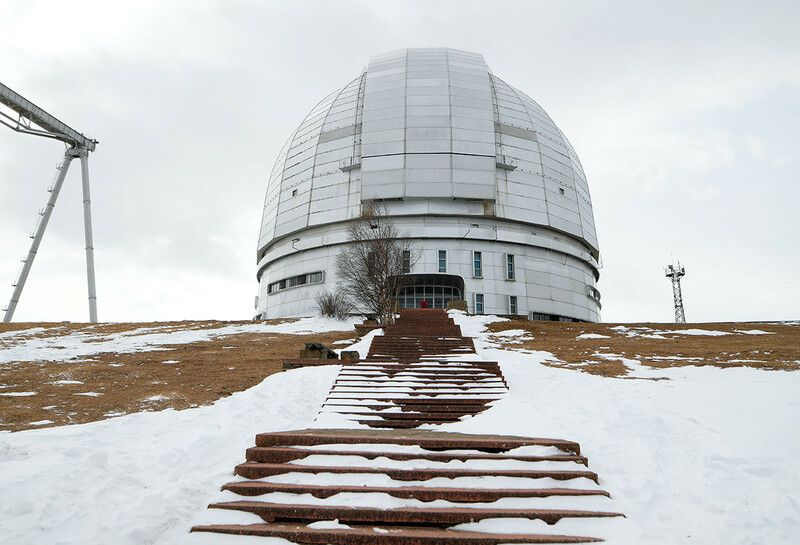 Some 17 km up a snaking mountain road you’ll find the largest astrophysical center in Russia, which is open for guided tours on Fridays, weekends, and public holidays. Sadly it’s not possible to look at the stars through the giant telescope, which weighs no more than 650 tons, but you can photograph the mind-blowing Arkhyz Valley until your heart’s content. Now you know how a khychin looks like. 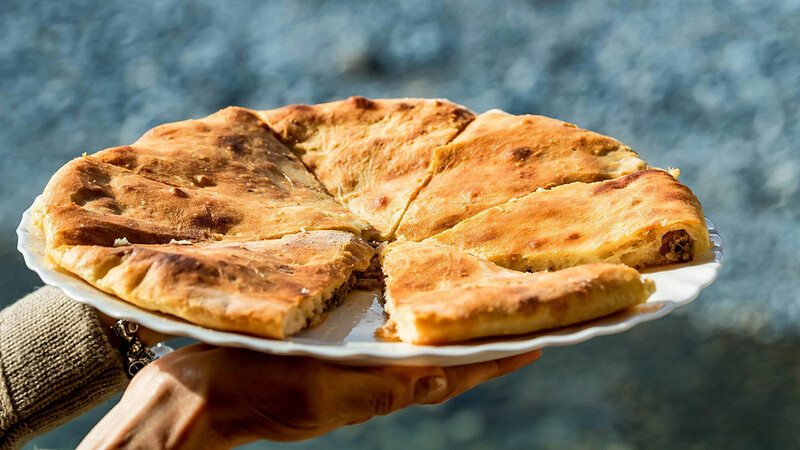 Karachay-Cherkessia may be known for its traditional Caucasian cuisine such as shish lamb kebab, rich shurpa soup, fresh cheese curds, and homemade ayran but there’s one dish that you won’t be able to escape from - you don’t stand a chance. Try to resist the delicious lure of khychins! If thick tortilla slathered in butter and stuffed with a juicy filling of mashed potatoes, cheese, herbs, or mince meat doesn’t make your mouth water, nothing will. One portion of khychins may mean piling on an entire kilogram, but even the most disciplined dieters won't be able to resist seconds. Street food with khychins at the resort of Arkhyz. Locals say that the mountain air removes toxins from the body, but when you ask them how to work off khychins they simply smile and give you another helping. Amazingly the tortillas are not considered a main course – they’re usually served before kebabs as a starter. And one more thing: don’t expect to be offered salads, fruit, or other frivolous dishes – food in the Caucasus is taken seriously. How to get there: The nearest airport is at Mineralnye Vody, 200 km from Arkhyz. From there you can either take a bus or taxi. How many times zones are there in Russia?